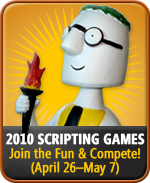 Psssst…Wanna Know the Dates for the 2011 Scripting Games? Here is the link to the 2011 Scripting Games All in One page that has information about sign up, events, study guide and more. We’ll be accepting scripts through April 22, 2011 (the same way we did it this year), but the events will be revealed over that two-week period. Mark your calendar! And of course look for many further details on this blog and our Twitter feed.